Divine have some stunning contortion acts that work beautifully at corporate events. Divine produces memorable and high impact performances designed to knock your guests’ socks off! Adding that elusive element of magic and excitement, they have earned a strong reputation for producing highly engaging and original produced work. They rehearse intensively, allowing them to build up a wealth of beautifully choreographed and polished material. Gleaming performance in heroic gold. These costumes can be worn for any of our skills, including stilt performance. For wandering performance artists can wear portable sound systems or lights if required, and dance in unison or improvise separately. They can also interact e.g. welcoming and guiding guests, or handing out space age or luxury treats. Stage shows can be set on traditional stages or all sorts of other spaces. As always our shows are arranged to fit the event. The clean, contemporary look of these costumes lends itself to added branding and styling. These costumes were originally commissioned for a Chorus Line production and have matching gold top hats and waistcoats if required. 4 identical costumes available, more can be produced to order. Our exquisite artists can perform mixed disciplines, for example combining Neoclassical Ballet with gymnastic or contortion performance. These costumes can be worn for any of our skills, including stilt performance. For wandering performance artists can wear portable sound systems or lights if required, and dance in unison or separately. They can also interact, e.g. welcoming and guiding guests, or handing out space age treats. Stage shows can be set on traditional stages and all sorts of other spaces. As always our shows are arranged to fit the event. The clean, contemporary look of these costumes lends itself to added branding and styling. 2 identical costumes available, more can be produced to order. 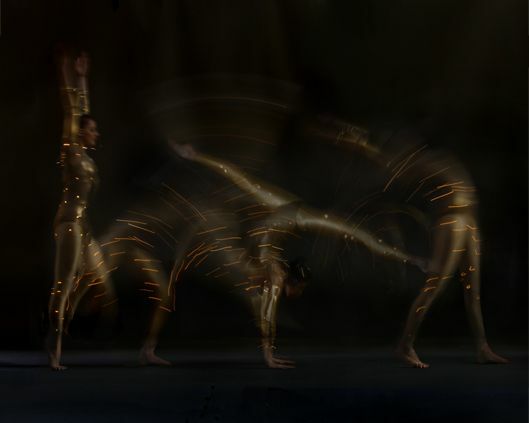 Electrifying gymnastic, dance and contortion performance from a collection of glittering light suits. Fitted with bright, multifunction LEDS and encrusted with crystals, mirrors and gems, our light performers are able to perform a range of skills. These costumes can be worn for any of our skills, including stilt performance. For wandering performance artists can dance, fold and bend individually or in unison wearing their own music boxes if required. Also available for staged performance, as always our shows are arranged to fit the event. We have a range of coloured leotards that can be worn in a similar way. A powerful combination of grace, skill and technology. Innovative, versatile and totally unmissable. These costumes can be worn for any of our skills, including stilt performance. For wandering performance Electric Rhythmic can dance individually or in unison wearing their own music boxes if required. Also available for staged performance, as always our shows are arranged to fit the event. Great base for creating other looks and adding branding. Coloured sashes or other detailing can also transform the look. We have a number of coloured leotards that can be worn in a similar way. 3 identical costumes available, more can be made to order. Daring contortion, magnificently presented in shimmering crystal and light. These costumes are laced with very bright multifunction LEDs. Light pulsates through swathes of clear crystal, framed by lavish quantities of gold, crystal and mirror detail. These costumes can be worn for any of our skills, including stilt performance. For wandering performance contortionists can bend and fold individually or in unison wearing their own music boxes if required. They can also perform stage shows. As always, our shows are arranged to fit the event. 1 costume currently available, 2 more are under construction, additional pieces can be created to order. Divine Company presents! Electric Showgirls streamlined, sensational, sassy, and unforgettable. These costumes can be worn for any of our skills, including stilt performance. Originally created with huge head-dresses and tail feathers, this streamlined version works beautifully for a variety of disciplines, dance, gymnastics, contortion, fire, ribbon and flag performance and more. For wandering performance Electric Showgirls can perform as interactive characters, talking to and dancing with guests. Also available for staged shows, arranged to fit the event. We can mix the costume parts so that each one has contrasting colours in a combination of yellow, blue and pink for an extra burst of colour. 3 costumes available, more can be made to order. ★ Divine produces memorable and high impact performances designed to knock your guests’ socks off!